Today I want to talk about a pipe character (a.k.a vertical bar). Or more specifically - a special role it plays in probing the quality of web applications. The pipe character is classified as unsafe in RFC 1738 - this puts it in a "grey area" hence a good candidate for testing how various frameworks and applications handle this case. When URLencoded this character is represented by the %7C sequence. 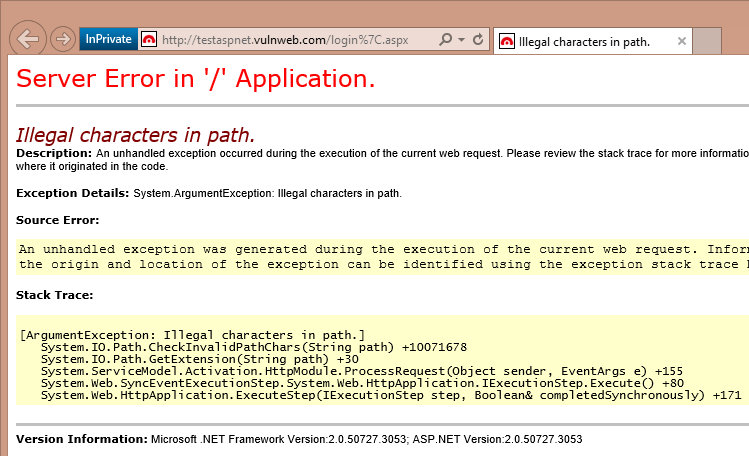 I love this character when it comes to testing error handling/custom errors setup in the .Net applications. A standard ASP.Net web application uses *.aspx file extension by default. As a test I like adding a pipe character in the page name (preserving the aspx extension to make sure the request is still sent to the .Net handler). It's worth noting that a similar approach quite often works for the "extensionless" ASP.Net MVC URLs too. I will demonstrate a few possible scenarios. 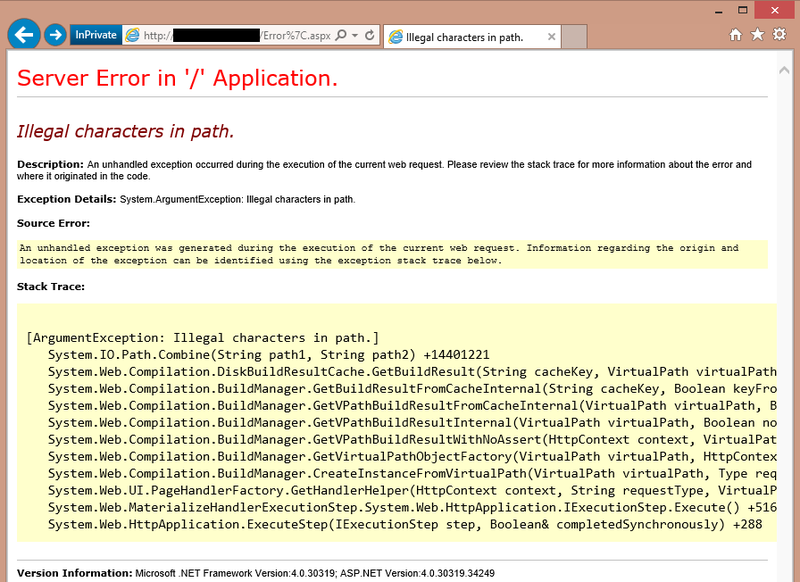 But notice that the error page is also a .Net page. What if we try to trigger the same error again in the error page itself? This is actually a very common scenario when the initial exception will be caught and handled properly but the error page won't be able to defend itself. 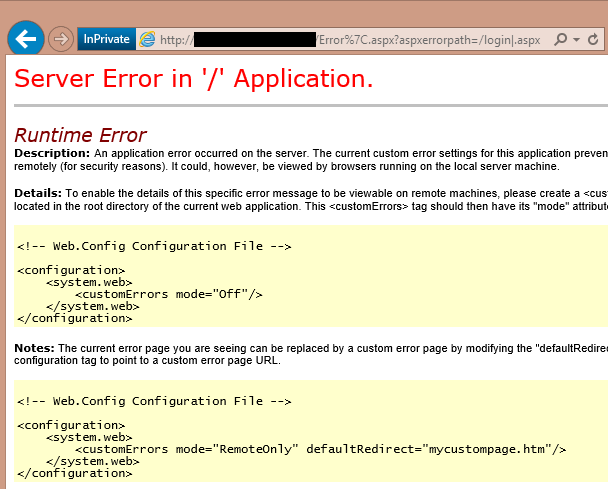 We have generated an unhandled exception but because customErrors were turned on in web.config we've got the page above. Not ideal but it can be worse. We get an "Illegal characters in path" exception. We see that this is an ASP.Net v2 application. Notice that we only have the System namespaces - user code hasn't been invoked yet! And this is why I love the pipe character. It helps uncovering various interesting scenarios - when customErrors are not setup correctly, when global exception handler (Application_Error) is missing, or when error pages themselves can't handle exceptions properly. This is a very simple test. So go on - give it a go, see how your application handles the pipe and leave a comment if you found anything interesting or if it helped you to make your application more robust. See this article for more information how to configure exception handling properly. P.S. another good character to play with is a tilde "~"